D. Compression Rubber: Specially Compounded High Modulus Compression Rubber for support to the Cord and better Wedging Action to the belt. The cover is manufactured from a cotton fabric impregnated with special compound of rubber. This cover resist external influence and secure uniform friction against pulley groves. The tension member is made of specially treated polyester cords, which have high tensile strength, low elongation and excellent resistance to bending fatigue. Cushion rubber maintains good adhesion of tension member and holds it in correct position. 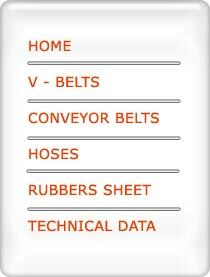 For belt's long life, specially compounded compressed rubber is used to resist extreme heat and compression. Oil & Heat resistant rubber impregnated fabric is extra flexible to prevent cracking. Strong tensile cord treated to carry high power loads without stretching. Tough fiber reinforced rubber supports tensile cord for extra stability. Laminated rubber impregnated fabric resists wear & cracking. 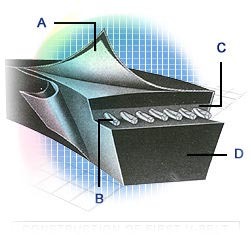 In Cogged Belts Moulded notch design increases flexibility, so belt runs cooler and longer. Hexagonal belts are suitable where the belt is to bend in both directions for Power transmission. These are used where several pulleys are located in one plane and direction of rotation of the driver pulleys is to be reversed without crossing the belt. Strong tensile cord with reinforced rubber and impregnated fabric gives the belt required flexibility to operate on both sides for longer operation life of the belt. The band over Classical, Wedge Section and Narrow V-belts. We generally manufacture to suit customer requirements in Classical Section, Wedge Section and all other V-series etc. They are mainly used for problem solving areas as such shock loads, V-flat drives, vertical shafts etc. Banded Belts are manufactured to suit customer requirements from 2 bands to 6 bands. Oil, Heat and abrasion resistant fabric for long trouble free operation. Strong tensile cord to carry high horse power. Flexible, oil & heat resistant cushion Rubber.